Venice Map and Walks, Full Version by GPSmyCity.com, Inc. 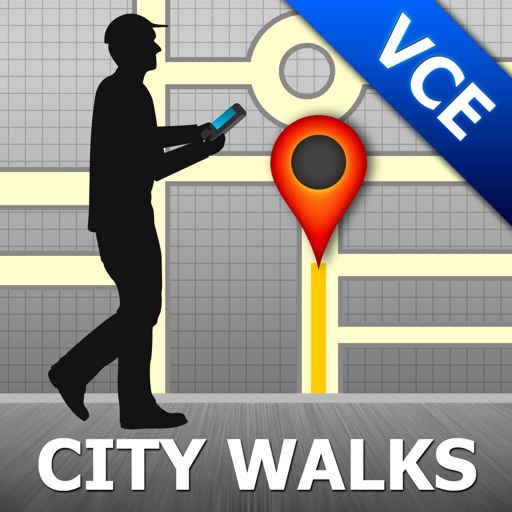 This handy application presents you several self-guided walking tours to see the best of the city, and it comes with detailed tour route maps and powerful navigation features to guide you from one sight to the next. No need to hop on a tour bus or join a tour group; now you can explore all of the best attractions on your own, at your own pace, and at a cost that is only a fraction of what you would normally pay for a guided tour. All the data used in this app is built into the software, so you can follow the walking tours or use the city map without internet access or cellular data plan. No need to pay the costly roaming charges when traveling to foreign cities. The app works with your iPhone, iPod Touch or iPad. * Built-in compass to show you the direction (this feature is not supported by iPhone 3G or earlier models, iPod Touch, and iPad wifi-only models). - You can now earn points for stamping sights. - Added support for iPhone 5 screen.